The main feature of muscle cars is that they are extremely powerful and have a comparatively high torque than sports cars. Indeed, when you purchase a muscle car, you are getting it for the torque. Most of this torque is focused on the rear tires, which means that muscle cars can pick up speed very quickly, more so than the horsepower of a fast engine. This makes them very effective at picking up speed in a straight line. Because of this, muscle cars are very popular for drag racing. When it comes to the aesthetic of sports cars and muscle cars, there is a bigger difference between the two at play. In terms of design, the comparison between the two types of cars is that muscle cars are American, while sports cars are European. Due to the fact that both kinds of cars have been built across Europe, Asia, and the Americas, this might not seem as relevant today. However, when it comes to the initial design of each style, this is an underlying factor. 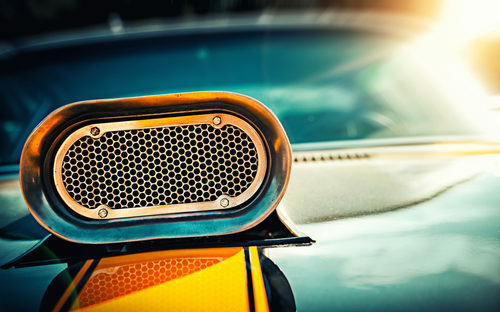 Muscle cars are built to look powerful and have sharp angles, making them more box-like. Sports cars are built to look more aerodynamic, with sloping curvature that makes them feel sleek and futuristic. Sports cars are usually made to be light and maneuverable. This means that they are a lot easier to control than muscle cars, which are usually made out of heavier materials, and value power over control. Because of this, sports cars are ideal at handling corners and maneuvering through tight spaces. Muscle cars can be built and fine tuned with regards to better handling, but this trait is inherent in a sports car. The heart of sports cars and muscle cars, their engines, are almost always going to be inherently different, since they are trying to accomplish different things. The engine of a muscle car is meant to be big and have a lot of underlying strength (this is what gives these cars so much torque). On the other hand, engines in sports cars are designed to be smaller and lighter, but have fast rotations, giving their cars a lot of horsepower.